Alfred Waud photographed in 1863 by Timothy H. O'Sullivan sitting in Devil's Den after the Battle of Gettysburg. Before immigration, Alfred Waud had entered the Government School of Design at Somerset House, London, with the intention of becoming a marine painter. This did not come to fruition, but as a student, he also worked as a painter of theatrical scenery. He intended to pursue that work in the United States, when he immigrated in 1850, seeking employment with actor and playwright John Brougham. In the 1850s, he worked variously as an illustrator for a Boston periodical, the Carpet-Bag, and provided illustrations for books such as Hunter's Panoramic Guide from Niagara to Quebec (1857). 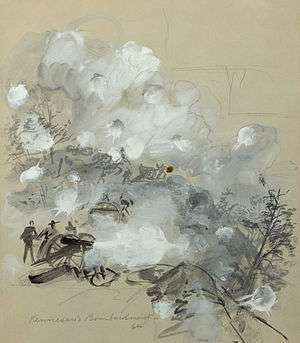 "Kennesaw's Bombardment, 64", sketch of the Battle of Kennesaw Mountain, scanned from the original and digitally restored. In 1860, Alfred Waud became an illustrator or "special artist" (a full-time paid staff artist) for the New York Illustrated News. In April 1861, the newspaper assigned Waud to cover the Army of the Potomac, Virginia's main Union army. He first illustrated General Winfield Scott in Washington, D.C., and then entered the field to render the First Battle of Bull Run in July. Waud followed a Union expedition to Cape Hatteras, North Carolina the next month and witnessed the Battle of Hatteras Inlet Batteries. That autumn, he sketched army activity in the Tidewater region of Virginia. Waud joined Harper's Weekly toward the end of 1861, continuing to cover the war. In 1864 Alfred's brother, William Waud (who up to that time had been working with "Frank Leslie's Illustrated Newspaper"), joined Alfred on the staff of Harper's and they worked together during the Petersburg Campaign. Alfred Waud attended every battle of the Army of the Potomac between the First Battle of Bull Run in 1861 and the Siege of Petersburg in 1865. Alfred was one of only two artists present at the Battle of Gettysburg. His depiction of Pickett's Charge is thought to be the only visual account by an eyewitness. Waud continued to be a prolific illustrator, doing numerous illustrations for Harper's Weekly and other prominent publications, achieving his greatest fame in his post-War work. David Meschutt. "Waud, Alfred R."; American National Biography Online (subscription only), October 2002 Update. Wikimedia Commons has media related to Alfred Waud. AskArt.com - Alfred Rudolf Waud (1828 - 1891).